One small player motorcycle manufacturers Indonesia, PT Minerva Motor Indonesia (MMI), try to reach or try some Indonesian motorcycle market, estimated this year reached 6.5 million units. According to the President Director of PT MMI Kristianto Goenadi, at a news conference after the launch of new products in JIExpo, Kemayoran, Jakarta, Tuesday (4/27/2010), hoping that this year sales increases. Last year, Minerva Sachs-by-confessed German name could sell 49 000 units for the various types. By launching its newest product, R150 VX, Kristianto estimates, sales this year reached 66 000 units. Last year, Minerva only sold 49 000 units. As for sales in the first quarter of 2010 had reached 16 800 units. "Until the end of the year, we hope to sell 30 000 units of this new product," said Kristianto. Her belief was based on a new product which experienced a total change and appear more stylish and fierce. In addition, sales of Minerva has been obtained from more motor sport. 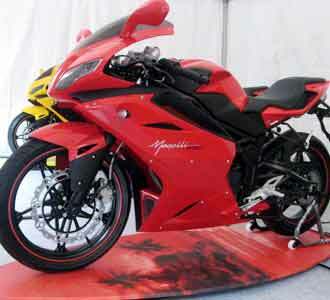 "We really focus on a sport bike," said Kristianto. It is proved from 60 percent of total sales contributed by R150 VX Minerva. Meanwhile, the types of sports with 250 cc engines get 30 percent share. According to Kris, close calls Kristianto, Minerva R150 VX experienced a total change from his predecessor, although still carrying the concept of both full-fairing. "New frames. Engine also received a touch so its power grows, "Kris beber. New feature of this motor, the front uses two types of projector headlamps, LED type lamp Sein, and the type of upside down front forks, monoshock rear suspension while ago. Designed driver's seat and luggage rack separately (high-low position) are made from materials with rough surfaces. Both rear wheels using ventilated disc brakes, digital speedometer, and tubeless tires. Added, this motor design is the result Mangelli, England, who judged champion motor sport design. 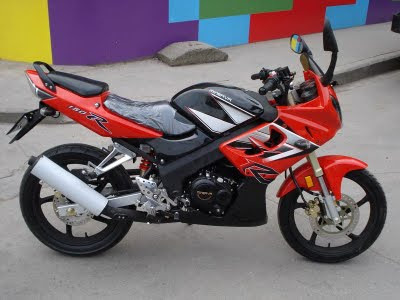 The engine, despite its capacity equal to the previous version, 150 cc, which is now bigger one PS or become PS@9.500 13.5 rpm. This machine is equipped with an oil cooler. In addition, to prevent engine vibration is quite hard on the old version, now equipped with advanced machinery Balancer shafts or as counterweight. When about to try a few reporters, Kompas.com try watching closely engine vibration. This new engine vibration is more subtle.